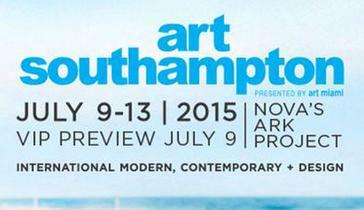 Southampton, NY - June 4, 2015 - Announcing new dates and a prominent new location on the grounds of Nova's Ark Project for its fourth edition, Art Southampton has cemented its status as the premier contemporary and modern art fair in the Hamptons, offering the highest quality works of art from the 20th and 21st centuries. The 2015 edition also will incorporate design and the decorative arts. Art Southampton will open Thursday, July 9th with a two-tier elegant VIP Preview benefiting the Parrish Art Museum and Southampton Hospital, sponsored by Christie's International Real Estate, GRAFF Diamonds, and Ruinart Champagne. The VIP Platinum Preview will provide prominent collectors, curators, art advisors, architects, designers and decorators the First View and opportunity to acquire the finest blue chip modern & contemporary works of art from the emerging, mid-career cutting edge, Post War and Pop eras, with a focus on design and functional art. The fair also will highlight some of the East End's most prolific past and present artists.